Region: This leafhopper can be found in Southern US and Northern Mexico. Unfortunately its Range recently extended into southern and central California. Very dry arid regions limit the geographic range of this pest. 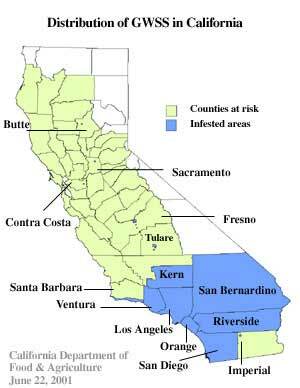 One wine region,Temecula, CA, was significantly damaged by this pest during years 2000 through 2005. Many vineyards were uprooted and replanted. Life cycle: This insect pest produces two generations each year. It lays egg masses from late February through May. The first generation matures as adults from May through August. The second generation begins from egg masses laid from June through September. The eggs are laid in the plant tissues. The adults migrate into forest or wooded areas and undergo pseudo hibernation until spring. 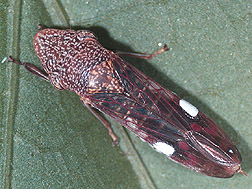 Physical Description: The Glassy-winged Sharpshooter is 1/2 inch long, leafhopper is dark brown color with small yellow dots on head and thorax. The wings are membranous, translucent, with reddish veins and are very good flyers, making them able to transmit plant diseases further than other vector leafhoppers such as the Blue Sharpshooter. The Glassy-winged Sharpshooter is a somewhat new Pierce's disease vector (carrier) and recently became established in California. This pest is a serious risk to California vineyards, because of its faster movements into vineyards. Subtropical groves such as citrus and avocado encourage high numbers. At immediate risk are vineyards near citrus groves (see biodiversity below). The parasitic wasp Yellow Sharpshooter Killer (Gonatocerus triguttatus) has been introduced into California in to control the sharpshooter. The Yellow Sharpshooter Killer is an egg parasite of the sharpshooter, laying its eggs within the eggs of the sharpshooter. Biodiversity - Most insect pests do well in a monoculture environment, that is, the same plant grown in row after row, acre after acre of the same species. Biodiversity breaks this up by limiting its range with temporary barriers, that provide host plants and food sources for beneficial insects (including the pest). Biodiversity in your garden and field crops is an ironic necessity.